The Modern Classroom strongly believes the state of the future world is in the hands of our young students. In association with Phalada Agro Pure & Sure, we curate an exclusive day programme, immersing students in the end-to-end process of organic farming as well as the farm-to-hand supply chain. Sustainability is the need of the hour and inculcating core practices and values in them allows for holistic growth. Each student gets a certificate for partaking in the programme and take home organic goodies. 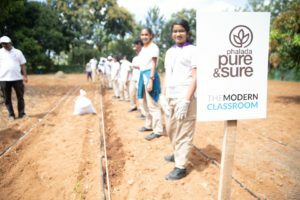 By exposing students to sustainable and accessible food production techniques, we aim to develop them into futuristic and holistic individuals. How does the food we eat get to our plates? Is it sustainably grown?